How do I set up my DYMO|Endicia integration for Shipping Labels? DYMO|Endicia is a service that will allow you to print your store's USPS shipping labels directly from your 3dcart Online Store Manager. This article will details the steps needed to sign up for the DYMO|Endicia service, integrate it onto your store, get quotes for the shipping label and ultimately print your labels as needed. Click on the "Enter Settings" button located under "Shipping Settings"
Follow the on screen instructions to create your DYMO|Endicia account. During the initial registration steps, you will have a Temporary Passphrase assigned to your Endica account. Upon entering the information on your 3dcart store, you will be prompted to change the temporary passphrase. Your DYMO|Endicia account is now integrated with your 3dcart store. During your registration process, you will configure billing information with their service and create a balance on your DYMO|Endicia account for future postage costs. However, after the integration is complete, you can also purchase additional postage from DYMO|Endicia as needed - right from your 3dcart Online Store Manager! Now that your 3dcart Online Store is integrated with your DYMO|Endicia account, we will show how to print a shipping label. You should now be seeing the order's information page with the itemized details of products ordered, billing/shipping information, etc. 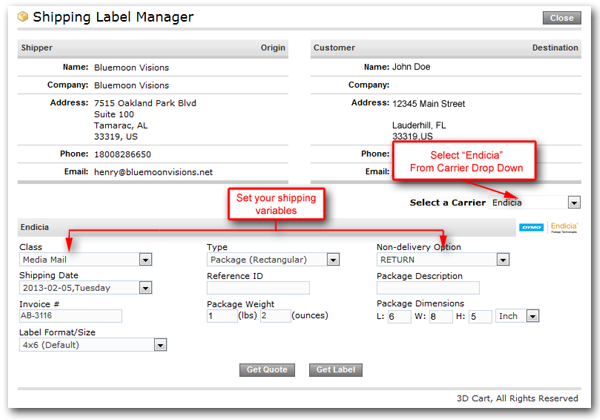 If you are dealing with an order that has a split shipment, click on the individual split shipment. Your 3dcart's Label Manager window will now open up. From the "Select a Carrier" drop down, select "Endicia"
Specify the package's shipping parameters like class*, type, weight, dimensions, etc. *If you'd like to see a listing of quotes based on Shipping Class, click on "Get Quote" to generate a preview. The Label Manager will now generate the tracking number for you, as well as give you the option to either Print, Void, or retrieve the label as a PDF file. Meanwhile, your DYMO|Edicia Balance will update to reflect the used postage cost.